In business since 1998, ECC Roofing & Siding offers proven solutions for your roof repair and siding installation needs. As a family owned and operated company, we take our customers and their needs very seriously. You'll never be just a number to us - instead, we hope to build a lasting relationship with you! We use proven products from Owens Corning and other top manufacturers on all of our jobs, so you can be sure you're always receiving high-quality solutions. All of our technicians are fully trained and certified to utilize these materials and carry out the work needed. We can't wait to get started and complete your dream home! Jim Milsop uses 20 years of roofing and leadership experience to successfully run ECC Roofing & Siding. Jim Milsop has been an entrepreneur revitalizing the expectations and experiences of working with a roofing and siding contractor since 1995. 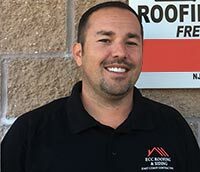 Jim started ECC Roofing & Siding in 1998 after gathering a thorough understanding of the best processes and practices in the roofing industry. He can make a quick and educated decision to meet your needs and budget. Overseeing all aspects of daily operations of the company and customer satisfaction, Jim brings 20 years of knowledge and over 10,000 satisfied customers to ensure your decisions are always in your best interests. As a lifelong resident of South Jersey, Jim is also passionate about bettering the community in which his business operates. Not only does he provide quality workmanship at fair prices, but he also ensures that his company is committed to the surrounding community. ECC Roofing & Siding is proud to be an Owens Corning Roofing Platinum Preferred Contractor. This means that we have been chosen to represent Owens Corning because of our expertise and dedication to customer service. Less than 1% of all roofing companies nationwide achieve this elite status, so you can be sure that when you work with us, you're truly choosing the best! "Mike m is an excellent addition to the company. He is very..."
"Length of time it took from agreement to completion took..."
ECC Roofing & Siding is revolutionizing the roofing industry by employing up-to-date technology on all of our projects. When you meet with us, we’ll come to your property with a full-detailed material presentation showing you exactly what we will be doing for your improvements. This dynamic approach allows you to make fully informed decisions about your roof or siding choices to ensure you’re completely satisfied!